Whether you’re going gluten-free and need a change of pace from quinoa and potatoes, or you’re just looking to add more nutrient-dense grains to your dinner routine, you’ve got more options than you may have thought! Here are nine new-to-you (yet very old!) options you’ve probably never heard of or tried. They are certainly worth becoming more familiar! Aztecs ate amaranth for thousands of years–and for good reason! 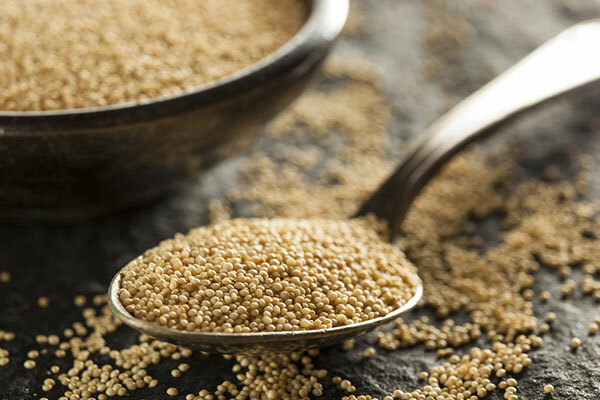 One cup of cooked amaranth has 9 grams of protein and 29% of your daily iron. How to Eat It: Boil one cup grains in 6 cups water for 40 minutes, then drain off excess water. Use it in tabouli salad instead of bulgur, or with bananas and cinnamon as an alternative to oatmeal. Believe it or not, there is no wheat found in buckwheat. It’s actually a fruit seed originally from China. Kasha is the roasted kernel form that we eat. One cooked cup has only 155 calories, 1 gram of fat, and 5 grams of fiber to keep you feeling full. When you see “whole grain,” “low fat,” and other health buzzwords on a food label, you might assume you’re picking up a more nutritious choice. Unfortunately, that’s not always the case. Some products don’t offer much of an advantage compared to the original or, even worse, aren’t inherently healthy at all. Let me share a few examples. I’ll admit it—I’ve given unsolicited advice to total strangers in the cereal aisle, but only when they look truly bewildered. It’s my nutritionist’s instinct, what can I say? Believe it or not, choosing a healthy cereal is not as complicated as you might think, especially when you follow a few simple steps. Kashi has just launched a new product line. Instead of adding a new breakfast cereal or another on-the-go granola bar, they’ve added a whole new line of easy-to-prepare steam meals. The bags come microwave-ready so all you have to do is find it in the freezer aisle, throw it in the microwave, and serve. 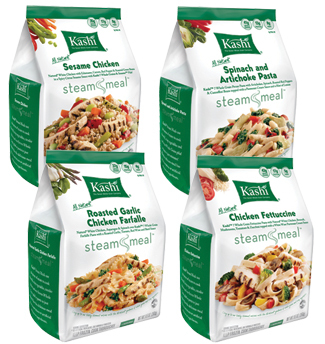 These steam meals come in four different flavors, each containing an average of 35 grams of whole grains, 17 grams of protein, 8 grams of fiber, and only 9 grams of fat. Different flavors vary. Each are the same in that there are no artificial ingredients and they’re all minimally processed. The bags come in a single-serving size making it easy for you to not over indulge, however, multiple bags will need to be bought if you plan on serving the whole family. Listed below are the four different flavors currently available. Mary Hartley, RD, MPH, is the director of nutrition for Calorie Count, providing domain expertise on issues related to nutrition, weight loss and health. She creates original content for weekly blogs and newsletters, for the Calorie Count library, and for her popular daily Question-and-Answer section, Ask Mary. Ms. Hartley also furnishes direction for the site features and for product development. Whole grains are a complete package. They’re tasty, nutritious, filling, and versatile. Yet, 93% of us don’t meet the three ounces a day requirement. In fact, the average American only eats about one ounce. Whole grain is the seed of plants in the grass family – such as rice, corn, oats, barley, rye, and amaranth. The seed, called a kernel, has three layers: bran, the tough outer layer; endosperm, the starchy inner layer; and germ, the kernel’s reproductive machinery deep inside the endosperm. Each layer has a unique nutritional value. The bran is rich in fiber; the endosperm is energy from starch; and the germ is flush with vitamins, minerals, and unsaturated oils. The fibers in the bran and endosperm work to cleanse the GI tract and to promote fullness and the slow release of blood sugar over time. August is National Panini Month and with temperatures too hot for the oven in most parts of the country, there is no better time to whip up a healthy version of your favorite pressed sandwich. Though there are a number of ways to make a healthy panini, Chef Tiffany Collins offers some tips about how to take ordinary ingredients, combine them in inventive ways and easily grill them on a panini press for a delicious, crunchy sandwich that won’t derail your diet. 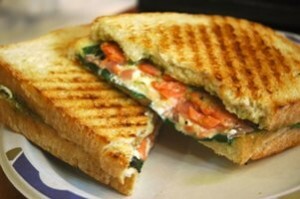 Pick whole-grain breads to make your panini healthy and satisfying. When you’re choosing bread for your sandwich, opt for bread that is rich in fiber. Some wheat breads are not actually made with whole grains, so read labels carefully before you purchase. 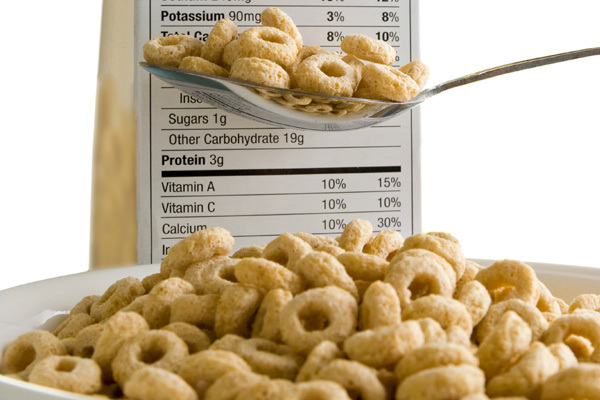 If the first words on the ingredient list are not “whole grain” or “whole wheat,” it is not really a whole grain. While many people steer clear of whole grains, they’d do well to give them a second look. 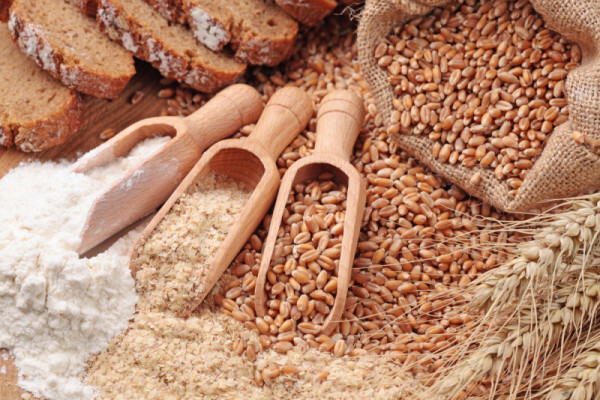 The average person eats refined grain products like white flour and white rice and avoids whole grains like the plague. 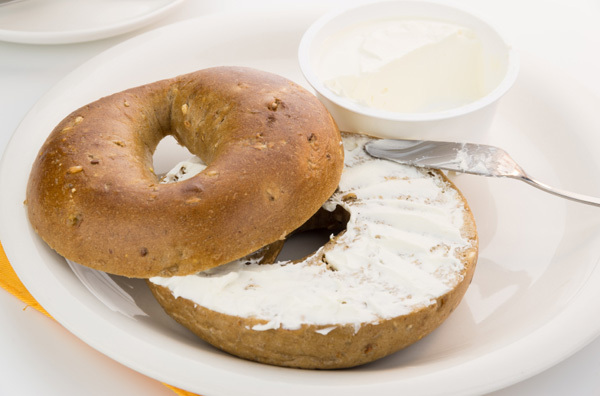 Meanwhile low-carb dieters swear off whole grains in favor of high protein options like meat and poultry under the false belief that all grains are evil to the dieter (whole grains actually help stabilize blood sugar — critical to the success of any weight loss regimen). And many other people simply avoid whole grains because they don’t know what to do with them or how to prepare them. There are many delicious and highly nutritious whole grains to choose from, so adding whole grains to your diet needn’t be daunting. Used as far back as the Stone Age for currency, food, and medicine, barley is a great addition to a healthy diet. Because barley contains plentiful amounts of both soluble and insoluble fiber, it helps aid bowel regularity. It contains 96 calories, 22 grams of carbohydrates, and 3 grams of fiber per half-cup of cooked barley. Unrefined barley contains abundant amounts of potassium. It also has lots of magnesium, manganese, vitamin E, B-complex vitamins, zinc, copper, iron, calcium, protein, sulfur, and phosphorus. This versatile ingredient can be added to soups, stews, cereal, salads, pilaf, or ground into flour for baked goods or desserts. When you’re manning the grill during a backyard barbecue, it’s still important to keep your healthy diet in the forefront of your mind. 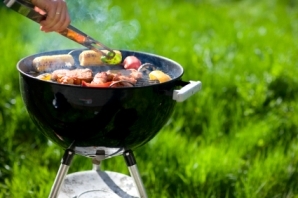 We chatted with David Venable, host of QVC’s In the Kitchen with David, about how to slim down and add more nutrition to your meals when you’re grilling this summer. If you eat burgers frequently during the summertime, choose turkey once in a while. Turkey has a wonderful flavor and less fat than most beef burgers. Though many people don’t realize it, stress symptoms have a negative impact on your health. In the short-term, stress can cause fatigue, gastrointestinal discomfort and headaches, among other ailments. Over the long-term, stress can make you susceptible to more severe conditions like high blood pressure, heart disease and even some cancers. While stress management is a powerful thing, not everyone has time to devote to techniques that have been proven to help, like yoga and meditation. Luckily, you can manage some of your stress with what you eat. When people think of eating to combat stress, they often think of comfort foods that are not typically very nutritious: ice cream, macaroni and cheese and calorie-laden mashed potatoes. Luckily, there are a variety of healthy foods – even super foods – that can help your body manage your stress levels and help you prevent feeling the stress – physically and mentally. My name is Carolyn and I blog about my weight loss journey on Weight Watchers over at Lovin’ Losing. I enjoy reading, baking, running, and playing with my furbabies. In my experience, when trying to lose weight one of the most difficult things to do is learn how to cook healthy. Food is an integral part of our lives and cultures and often, friends and family who aren’t trying or don’t need to lose weight have a hard time adjusting when you start changing their favorite recipes. Sometimes the cook tries to make two versions of meals to appease everyone, gets overwhelmed with the work involved, and quits their weight loss journey. I’m here to say, that doesn’t have to be you! Here are a few tips for getting friends and family on board with healthier cooking.